When Gregory Klemmer’s father was in the hospital awaiting surgery for cancer, he knew the situation was dire. He also knew he had to say something poignant to help his hero through it. “I said, ‘You’re going to go 4-for-4, just like Tony Gwynn,” Klemmer recalls. Sure enough, his father made it through the surgery. Klemmer had the privilege to tell that story to Gwynn a few years later when he saw Gwynn in the San Diego Airport. “I had his full attention. He had tears in his eyes and he gave me a big hug,” Klemmer said. 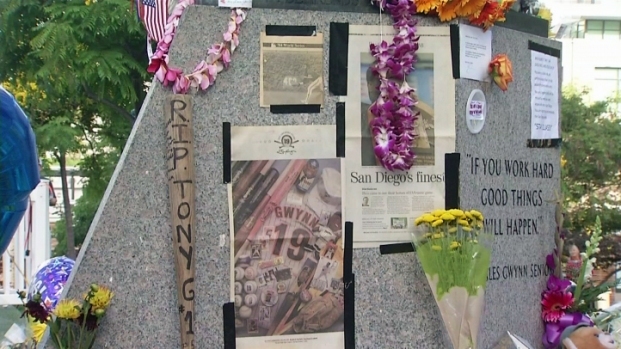 Fans of Tony Gwynn gathered at his statue in Petco Park Monday after learning of his death. NBC 7’s Greg Bledsoe talked to fans brought to tears over the baseball great’s passing. The stories of Gwynn’s greatness were told all around Petco Park this morning, as fans came to pay their respects to “Mr. Padre” next to the statue that bears his name and likeness. Gwynn died of cancer todayat the age of 54. But his memory will live on forever in the hearts of so many Padres fans. Summer Serrano, President of the San Diego Madres non-profit organization to encourage youth baseball, had tears in her eyes as she recalled Gwynn’s impact on baseball and the community. San Diego resident Steven Casillas left flowers and a note for Gwynn at his statue, just like he did for Hall of Fame broadcaster Jerry Coleman, who died earlier this year. 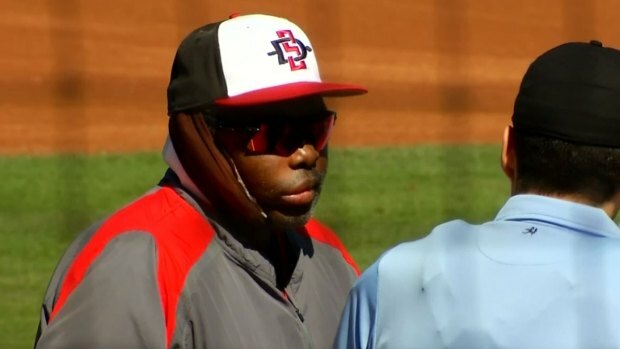 NBC 7 sports photographers captured the last appearance of Hall of Famer Tony Gwynn at SDSU on June 11, 2014. “I know he knows what he meant to San Diego,” Casillas said of Gwynn’s legacy. Fans were torn as to their greatest memory of Gwynn on the field. Many talked about his home run off the façade of the upper deck in Yankee Stadium during Game 1 of the 1998 World Series. Others remembered his induction into the Baseball Hall of Fame in 2007. Padres fan Mark Brown remembers seeing him get five hits in a game at the old Jack Murphy Stadium, a feat Gwynn accomplished nine times (second most in baseball history only to all-time hits leader Pete Rose). Brown also was in attendance for Gwynn’s speech after getting his 3,000th hit in 1999. Larry and Mary Anne Berrones were also at the stadium that day, sitting down the first-base line. They were at Petco with flowers and balloons for Gwynn this morning. The theme of family resonated throughout the crowd all morning for Gwynn, who played with his brother Chris and mentored his son, Tony Jr., a current player for the Philadelphia Phillies. Gwynn is considered an honorary family member by many fans who never even met him. Follow developments in this story throughout the day by downloading our free NBC 7 App here.